Here is an idea I got from a web site called: http://www.funny-potato.com. There was no photo credit, so I am not sure who the original photographer was, but it is definitely an interesting idea for a family portrait. I've also seen some bad attempts with similar cute ideas, but done in bad taste. Theme photos for families are great with sports, hobbies and holidays. Just be careful who gets to see them. Once they are put on the web, they can be shared and distributed to anyone and everyone. Another idea for a family portrait that some would like to make fun of, but I am sure this family has great memories of their crazy portrait and their visit to Niagara Falls. 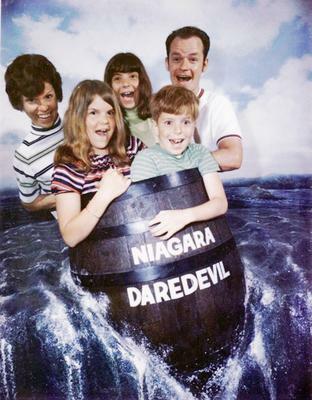 Yeah, it's staged and everybody knows this family did not ride a barrel over the falls and plunge hundreds of feet to the rocky turbulence below. Staged portraits "are what they are" and should be judged on that basis. Photography captures a moment in time and that's what our lives are all about, a series of moments in time. Some are significant and shape our lives forever. Some moments are mundane and unimportant and then there are silly family moments that we can photograph and remember with a little laughter for years to come. This photo was posted on the Chicago Tribune web site and the credit was given to Awkward Family Photos. Here is another one of those theme portrait ideas you can use for your family. It was a good idea to stand the ladies up since the sunflowers are so tall. 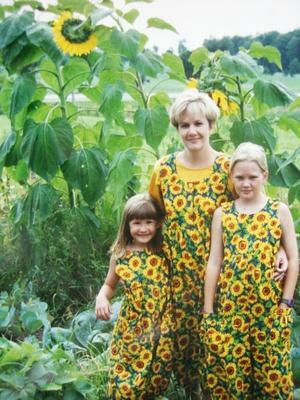 Would love to see this pose with one or two more actual large sunflowers facing the subjects more. I've seen tasteful, sensuous, boudoir photography done with rose petals as the flower partially covering the model along with roses as the background. Matching the clothing to the background is often a good idea with portraits. One of the most common mistakes in portrait photography is to forget to pay attention to the back ground. It should compliment your subject, not distract it. Obviously the young family missed their departed love ones and had the idea that they wanted their lost family members included as part of their photograph. 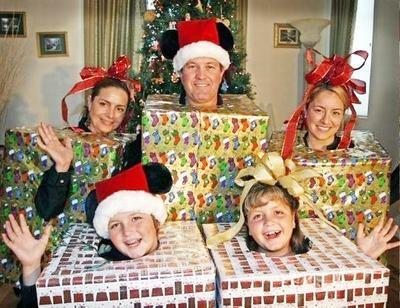 For some people this is a controversial idea for a family picture. Critics would call this a bit morbid. Personally, I have no problem with it. In fact, within a month of each other I did this same thing for two different portrait clients. The first was at a 50th wedding anniversary celebration. One of the guest's husband had been recently killed serving his country as part of the military efforts overseas. His head shot was included in the group photo. In the 2nd job I did only a week ago, I photographed several large family groupings as part of a huge, once-every-five-years, family reunion of about 150 people. One of the individuals who was at the last picnic 5 years ago was tragically killed as well. His photo was held by one of his family members. 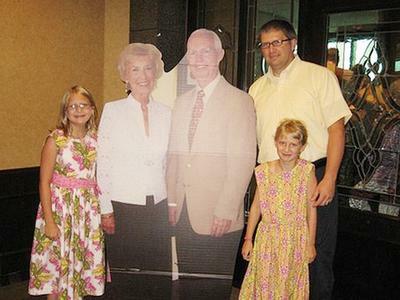 In both situations, the family chose to include the missing person by using a life-sized, cardboard cut-out of the absent person's head. It is an idea that was most likely supported by the entire families involved, but perhaps maybe an outsider, not in a similar situation, might think to be a little unusual.